From 4-7 p.m. Thursday, Dec. 6, Santa will stop by the store at 207 Broadway St. to take free photos with children, who can also drop off a wish list with him. Harding Grange will host a free waffle breakfast from 8-10 a.m. Saturday, Dec. 8, at 21552 S. Fischers Mill Road. The 25th annual Christmas Festival of the Choirs is scheduled for 7 p.m. Saturday, Dec. 8, at the Estacada Auditorium, 500 N.E. Main St. Singers and choir groups come from local churches and schools. One of the choirs is comprised of local singers who perform selections from Handel's "The Messiah" and is seeking additional singers. Rehearsals will begin at 7 p.m. Saturday, Nov. 3, at Estacada First Baptist Church, 29101 S.E. Eagle Creek Road. All vocal ranges are welcome. For more information, contact Edith Cameron at 503-630-4470, Rendell Frunk at 503-630-8515, Shirley Lippincott at 503-630-4711 or Roger Woods at 503-630-4913. The next Good Morning Estacada networking event, organized by the Chamber of Commerce, will be held from 8-9 a.m. at Yo Treats Frozen Yogurt, 401 S.E. Main St.
From 5-7 p.m. Saturday, Dec. 15, at the 445 S.E. Currin St., Santa will be available for photos in front of a fire engine, and hot chocolate will be served. 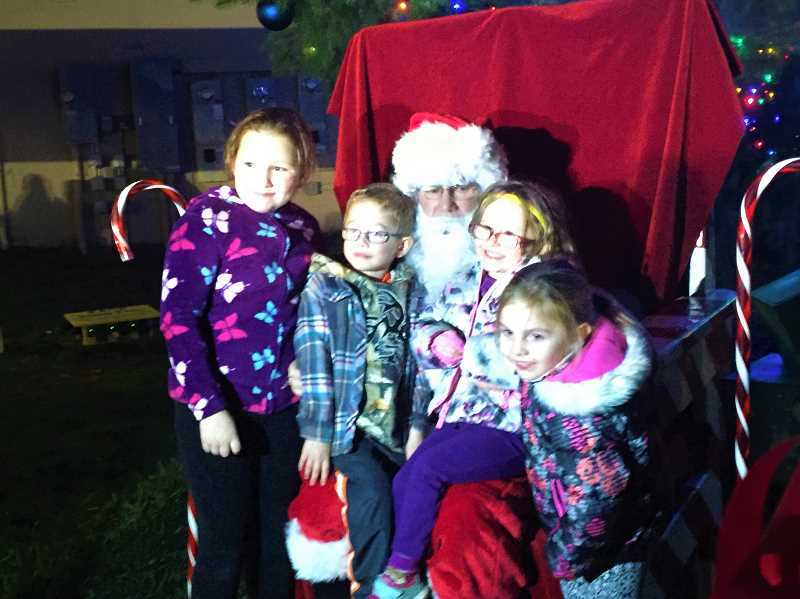 From 5-8 p.m. Saturday, Dec. 15, several locations in Barton will participate in holiday festivities. Santa and Christmas trees will be at Barton Store, 24802 S.E. Bakers Ferry Road; there will be music and a live nativity scene at Barton Church, 25400 S.E. Highway 224; and gifts will be available for purchase at Barton Antique Mall, 25618 S.E. Highway 224. Estacada Community Outreach will host a free breakfast from 8-11 a.m. Saturday, Dec. 15, at Clackamas Valley Baptist Church, 29275 S.E. Eagle Creek Road, which is a new location. There will be free shuttle service between City Hall and the church. Pick up times will be at 8 a.m., 9 a.m. and 10 a.m., and drop off times will be 9 a.m., 10 a.m. and 11 a.m. The group, open to girls in grades 6-12, will meet from 3:30-5:30 p.m. the first and third Thursdays of the month. The Estacada City Council will meet at 7 p.m. Monday, Dec. 10, at City Hall, 475 S.E. Main St. Call 503-630-8270. The Estacada School Board will meet at 7 p.m. Wednesday, Dec. 12, in the Estacada High School Choir Room, 355 N.E. Sixth Ave. The Estacada Rural Fire District Board of Directors will meet at 7 p.m. Thursday, Dec. 20, at 261 S.E. Jeremy Loveless Ave. The Estacada Cemetery District meets at 4 p.m. the first Thursday of each month at City Hall, 475 S.E. Main St. The next meeting is scheduled for Thursday, Dec. 6.